Left the Corporate World for Cats & Canines! Hi! I'm Laura. 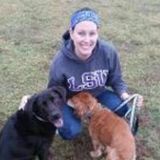 I would love to talk to you more about your pet care needs. I've been walking dogs and pet sitting in the north-Dallas area for several months and spent several years pet sitting in other cities prior to that. I am comfortable caring for all breeds/sizes of dogs, as well as cats, birds, fish, some small mammals, and some farm animals. I have experience giving meds to dogs and cats and will be pet CPR/first aid certified within weeks! I would love to hear back from you and set up a meet & greet! Hi, I'm Dustin. I've been a dog dad since a child and have worked professionally caring for animals past.